There were some aspects of this Beauty and the Beast reworking I found really interesting — mostly, the Greek mythology that was mixed in. It didn’t feel like a typical woodsy-castle-y faux-medieval-y setting, which was refreshing, and the references to the Kindly Ones — aka the Furies — worked pretty well for me. The complex relationship between Nyx and her sister was actually kind of interesting too; it’s not straightforward, because everything is not as it first appears, and neither of them are honest to each other. But otherwise, there were a lot of aspects of this I just couldn’t get into. Both the relationships the main character had just felt off, despite the attempt to show a dichotomy between the two where one, to borrow Tolkien’s phrasing, ‘looks foul and feels fair’ and vice versa (except mostly acts/feels; they’re both handsome, as I recall). The romance tends to the insta-love trope, and given that Ignifex never makes himself really pleasant (unlike, say, T. Kingfisher’s Beast in Bryony and Roses). There are some interesting aspects, as I said, but looking back at it as I write this somewhat belated review, it definitely never came together for me, and it didn’t really become memorable either. Sorry to hear you didn’t enjoy this one more! I haven’t read this or Crimson Bound yet, but I do have them both on my Kindle so maybe I’ll read them, although your mention on insta-love is enough to make me consider skipping. I’ve wanted to read Rosamund Hodges for so long. I really should get on that, though probably not starting with this book because I’m honestly a bit burned out on Beauty and the Beast, plus, it sounds like it has its issues. Maybe Crimson Bound, or the new book she has coming out later this year. Yeah, it’s not that fresh a twist on the story. 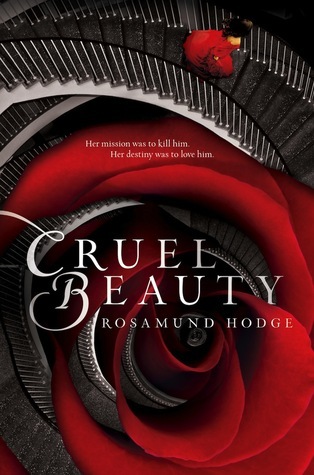 I miiiight check out something else by Rosamund Hodges; there was enough there to make me curious. I’m sorry you didn’t like this better. I listened to the audiobook a while ago, I think it was one of the first reviews I posted on my blog, actually. And I liked it okay but I get what you’re saying about the romances. I liked the setting, too, though it was sometimes a bit hard to follow because I was listening to the book, like I couldn’t go back and check to see if I’d missed something. I haven’t read Crimson Bound yet but I’m curious about it, so I’ll probably get to it sometime soon. I’m kind of curious about Crimson Bound too, now, so maybe I’ll check that out! If I see it on sale, at least.